The first Toyota 4x4 pickup rolled into Canada in 1979 pretty bare boned: vinyl floor, 4-speed manual transmission (with a very sloppy shifter), bench seat and an AM/FM radio. The only real comfort was the front vent windows that you could reverse to give some air flow in the cab, and that feature didn?t come until two years later. Warranty support:Basic 60,000km, Powertrain 100,000 km, Corrosion Perforation Unlimited km. 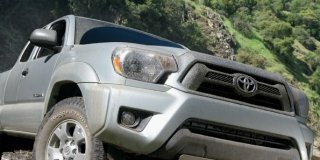 The on-road driving capabilities are good and firm for a truck, but the off-road capabilities is where the new Tacoma shines. Toyota keeps producing and upgrading the iconic truck and Canadians will do their part by continuing to buy them.